The brothers Garry, Roger and Russell Christian together with Henry Christian Priestman formed the Christians in 1985. Roger left the band in 1987 because of his reluctance to go on tour. After a very successful debut album and a couple of charity singles, the band released their second album 'Colour' in 1990. It was preceded by the single 'Words', based on a traditional folk tune. It was a good success in Europe, where it became a number 1 hit in France and peaked at number 5 in the Netherlands. It did less well in the UK, where it stalled at number 18. 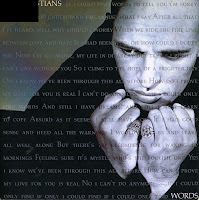 The vinyl single features an edit of 'Words', whereas other formats contained the full album version which lasts over 7 minutes.